Do you need a pool or foosball table for your business? Rental allows you access to our equipment and expertise without the expense of purchasing outright. Many businesses eat enough capital without having to pay many thousands of Ringgit for ownership of equipment that we are able to rent to you for a small weekly amount. All revenues from the rented equipment is yours. You are in complete control. 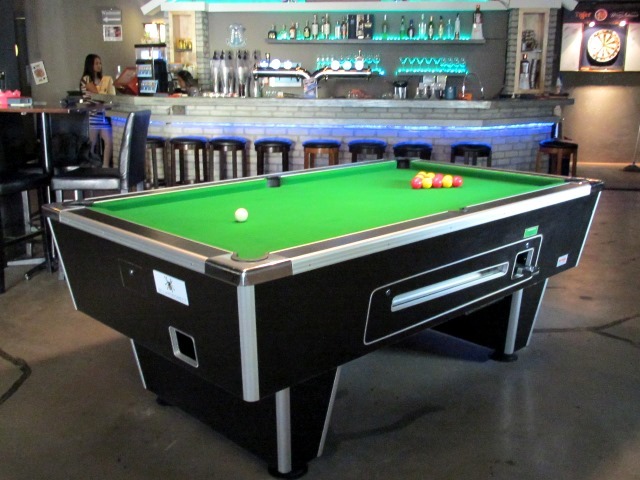 One month rental bond & one month rental in advance (new customers receive 200 tokens provided for free if the table is coin-operated, RM80 including GST per 100pc on further token purchases) is all you need to have pool tables delivered and installed in your establishment. Lightshades are also provided for you to hang, if required. All equipment rented will come ready to play with playing accessories. During the period of the contract all additional accessories, twice monthly Service and one recloth per year will be provided by Eight Ball Sdn Bhd at no additional expense. Any table malfunction that cannot be fixed with our phone support will result in an additional service by us for free. One phone call and we will be there within 48 hours. Rental paid monthly, one month in advance, and one month bond. Replacement balls and accessories throughout the year provided free, with one recloth. Service & Maintenance on tables and accessories by Eight Ball twice monthly.